The free one Apple gave me broke a few months ago and the iPhone has been naked while I've been indecisive about what case to buy next. Kate Spade knows how to make one darn adorable case. This mug solves my travel mug conundrums; I hate the plastic tumblers because the plastic always makes the coffee taste weird and you can not put them in the microwave, so I'm stuck drinking my lukewarm coffee. This mug is essentially a regular coffee mug with a removable plastic lid - so I can reheat my coffee to my hearts content. And did you notice how cute and even non-christmasy those falalas look? I can totally get away with using this year round. This is one of those fantasy items, but I've been smitten with this bag for ages. Great shape, great size, and cute little birdie details! In the past I'd searched and searched for the perfect camera bag that was an elegant marriage of style and affordability. In the end all the bags worth having weren't really in my budget. This little insert solves that dilemma. Now every one of my bags can be a camera bag. I love a statement ring. I love the color and the huge amethyst. As a bonus, Shopbop states this ring was made in the USA. I heard on the news that if everyone spent $64 on Christmas gifts made in America, that we could create 200,000 jobs. So not only would I get an awesome ring, but someone else would get a job. Win-Win. Even though I already own a pair of red pumps, they are patent Mary Janes and I can not wear them without garnering several Dorothy comments. I do love my little MJs, but I think it might be time for a more grown-up red pump. No one will be going to see the Wizard in these suede platforms. A vacation to someplace with palm trees. What are you wishing for this December? P.S. This awesome clock I picked up at my church fair for $1 this weekend is broken. It was functioning when I took it home, but 20 minutes after I hung it on my wall it just stopped. I put in a fresh battery and coerced it into movement, only for it to stop again in an hour. A little searching lead me to a near identical clock from Target, and of the two reviews, one of the reviewers described a similar problem. I really love the clock though! Can battery clocks be fixed? Would it be worth the effort/money? I love that Marc Jacobs purse too! 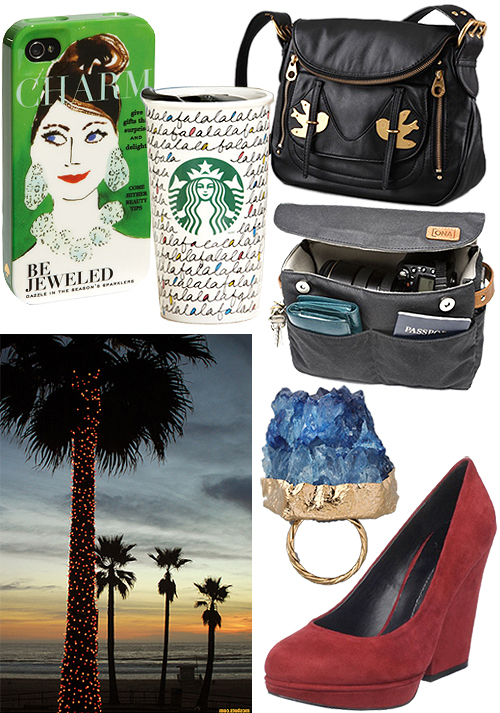 (duh...haha) Some great wishlist items! I'd love the statement ring for starters then would settle on the pumps as the main present! That iPhone case is AMAZING. I want it - even thought I don't have an iPhone yet. My lust is a pair of Sam Edelman heels. I can't bring myself to spending that much on spiked heels! Oh my gosh, that Kate Spade iphone case is just adorable! My case right now is broken and a bit grungy, so I will definitely be upgrading to something a little more fashionable like this one! I think that Marc Jacobs bag is ADORABLE! Oh that camera bag is cute and practical! Wow, I love that bag - that's so going on my wishlist now! you can just replace the clock mechanism for a moderately cheap price (under $10).. Just hit up your local craft store and ask for the kit. You can turn proactically anything into a clock these days. If not you can just set the clock to a time you like and use it as an statement art piece.. Good Luck! I think I need those shoes and that camera bag! I like that phone case. The only thing I really want right now is a new pair of slippers. So funny! The camera bag situation is so prevalent yet why is there no solution for it? If you get the Ona bag, let me know how you like it. I've had my eye on it for some time now but am unsure about how it'd sit in my bag in reality. What kind of camera do you have? I need that amazing Kate Spade i Phone case! and love the Marc by Marc bag of course :) great holidays picks! I don't want to think I want anything for Christmas. in fact i was thinking yesterday about telling people who might gift me to just buy a gift for a girl (ages from 7 to 14) and then just give them away. I think i need a ban. I just got myself a new case! It's not Kate Spade though, forgot about those. This reminds me I need to do my wish list soon!! I hope you get those chunky heels, they are pretty spectacular! I dont know a whole lot of clocks but if I had to guess I'd say the expense of having it fixed probably wouldnt be worth it. I also just wanted to pass along information about a $150 Perricone MD skincare giveaway to you and your readers. It's an amazing opportunity to get some self-care this holiday season! I hope you'll get a chance to enter because I know you've had luck before! I'll take that vacation..i love palm trees!! BEST ring ever.. and I love that- creating jobs in the US while getting ourself gems. amazing. VACATION! Definitely at the top of my wish list! That Kate Spade cover is so adorable and holy crap I need that camera bag insert!! I always run into the same problem as you, where the best bags are out of my price range. This would definitely solve the problem! Thanks for the suggestion! i'm with you on that camera bag and red shoes!!! i hope you've been doing well pretty girl, sorry i haven't been around, i just haven't even been online! I am now wishing for those shoes! My husband keeps asking me what I want for my bday (Christmas baby) and now I have something to show him. Sorry for stealing it!! Marc Jacobs bag is pretty, but so pricey! What a cute iPhone case and you can never go wrong with a cute MJ bag and colorful heels! The ring and pumps are amazing. Blah. I also would love a vacation to somewhere warm and sunny. It's horrible and cold and dark here. Take a look at mine!